Most manufacturers recommend an oil change for your vehicle every 3000 miles so come in to Adventec Auto Repair for your next oil change! 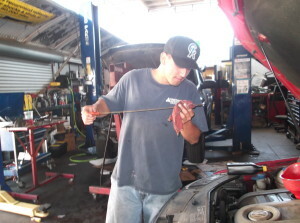 We’ve been supplying affordable oil changes in San Diego for more than 25 years. Getting regular oil changes for your vehicle will help it run smoother and keep your engine running longer. In San Diego, oil change costs can vary substantially and a lot of shops use cheap oil in order to save money. At Advantec Auto Repair, we use only the best oil and we provide oil change deals to customers getting other work done because we want them to get the most value out of coming to our shop. On top of providing the best oil changes in San Diego, we provide a complete vehicle examination performed by our ASE certified mechanics.